The blog of Avinash, Christina, Anya and Kyan Meetoo. Today is an important day in my life : this is something that I wanted to share to the world since, at least, 15 years! Yes, I have a photo of the infamous Brain Virus! The two brothers put their coordinates in the virus. I wonder if the phone numbers still work? By the way, Basit and Amjad are now in the ISP business. I used PC Tools Deluxe 4.22 to view the boot sector. PC Tools was an extremely versatile tool. I used it to do my normal daily file manipulation routines (copying, renaming, deleting). 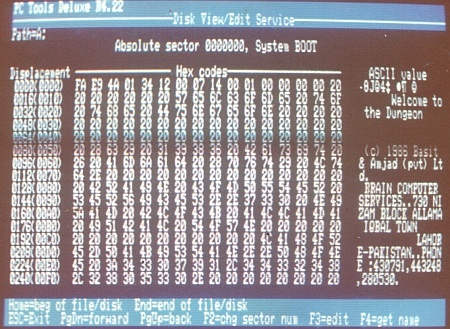 It also featured lots of low-level functions like displaying the boot sector of a disk. It was cool but, unfortunately, I could not find one single interesting site on the whole Internet on it. The graphics card was a Color Graphics Adapter which could display (hold your breath) 4 colours at 320×200 (and, still, the games were intensely playable) and had a monochrome mode at 640×200. It also could display text at 40×25 or 80×25. I wonder how many of you knew hexadecimal when you were 15-16? yep 640K ought to be enough for anybody. I’ll attribute this quote to me since bill doesn’t want it. btw, as I mentioned before, my keyboard is an authentic 101/102 keys for use with 8088 and 80286 systems. Despite the vintage yellowish tint of the yeys, it’s the toughest keyboard i’ve used yet. They just don’t make them as they used to. and i happen to have a 51/4″ drive somewhere around here. I don’t know if it’s still functional. and yeah I was tinkering with hex editors to beef up my character stats in diablo 2 (self-taught!!) which was about 2000-2001 so i guess i had some vague notions of hexadecimal notation at around 16-17.
but not enough to compare with your experience. What do you want me to talk about? This work is licensed by Avinash Meetoo under a Creative Commons Attribution-NonCommercial-ShareAlike 4.0 Unported License.